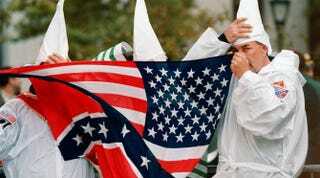 Three members of the Ku Klux Klan hide behind a combination Confederate and American flag Oct. 23, 1999, in New York. Last week CNN sparked a backlash with its headline, “Can the Klan Rebrand?” Their story was a look at the Ku Klux Klan’s efforts to distance itself from its reputation as a violence-inciting hate group in the wake of former Klan Grand Dragon Frazier Glenn Miller being charged in a shooting spree that left three people at two Jewish community centers dead. Apparently, having a high-profile hate murderer affiliated with one’s group can put a damper on your image. A few weeks ago, the Klan began leafleting other neighborhoods in Pennsylvania, as well as Texas, Illinois and Louisiana, with fliers intended to recruit new members. Though the Klan has not specifically been linked to the egg incident, the message being perpetuated by it is certainly one the Klan would likely appreciate, which is this: America is becoming unlivable for those who yearn for the America of yesterday. An America that didn’t have a black president—and not just black, but one who is the product of a relationship between a black man and a white woman. And an America in which minorities are rapidly becoming the majority. In 2012 I interviewed Gordon Baum, longtime head of the white supremacist group Council of Conservative Citizens. During one interview he expressed concern about the fact that white babies no longer made up the majority of babies being born, noting at the time, “Well, we’ve been warning about that.” He added: “Do we want to see our country become more like where these people [racial minorities] are from or not? Now that’s a quantitative judgment. And we as an organization prefer to see it remain as it was … when Europeans had America." Perhaps he’s never heard of Native Americans—but I digress. Baum was certainly not alone in his thinking. As I later wrote for The Root, white supremacist sites were overwhelmed with traffic in the days following President Barack Obama’s election. Which is why I believe these latest efforts by the Klan, as disheartening as they are, really could be a good sign. Intolerance is at its most passionate and visible not when inequality reigns supreme but when equality gains ground. After all, lynching reached its peak, as a reaction to slavery’s end, in the earliest part of the 20th century, a time period that happened to produce history’s first black millionaires; the so-called Black Wall Street in Oklahoma; as well as the first flashy black celebrities, including boxer Jack Johnson—known, among other things, for his interracial dalliances. Even more noteworthy, the Klan itself was first established by disgruntled Confederates after the South’s defeat in the Civil War. After losing, and seeing black Americans take their places in Congress and other halls of power in the days of Reconstruction, the reaction among those who saw themselves losing their power and way of life was to turn to hate, and to try to convince others to do the same. But here we are in 2014. The black president got a second term, despite the outrage of the very hate groups that didn’t want to see him get one. And our country is not only becoming browner, but mixed-race families are among our fastest-growing demographics. If I were in the Klan, I suppose I might be freaking out too. But since I’m not, I will simply enjoy watching them freak out and know it means we are becoming a better country.